To get acquainted with Voice Synth and discover the endless possibilities, it is easiest to start playing with the more than 250 built-in factory presets. On the preset panel, choose a sampler (S) or live (L) preset and have fun. With a headset, hold the mic close to your mouth and speak with clarity and passion. It will truly be an incredible experience! Voice Synth is available on the iOS App Store (full and modular version), and on the Mac App Store (full version). The full versions support all features right after purchase/download. The modular version 'Voice Synth Modular' (formerly known as 'Voice Synth Free') provides a free try-out with full functionality in two modules available via in-app purchase. The iOS version is compatible with iPad, iPhone and iPod Touch. The macOS version is compatible with iMac, Mac Pro and MacBook (Air/Pro). Presets are interchangeable among all versions. If you want to reinstall Voice Synth on a device, remember to download the same version you downloaded originally. If you use the same Apple ID as for the original purchase (either full app or in-app purchases for the modular version), you will not be charged again for the same download/purchase. Different from most synthesizers, Voice Synth uses your voice as basis and applies effects to it. For that, Voice Synth needs access to audio input such as your device's built-in mic, or the mic in a headset. On iOS, you have to grant Voice Synth access to the microphone via a popup that iOS provides when you first launch Voice Synth. At all times, you can grant or revoke the access via the iOS device Settings app (Settings/Voice Synth/Microphone). Live mode will change your voice as you speak, instantly. It requires a headset or an external audio device, otherwise loud audio feedback may occur from your device's speaker right back into its microphone. If you do not use a headset or other device, a voice repeater will be activated to prevent audio feedback. It automatically records when you speak and afterwards plays Voice Synth's result. You can also use Voice Synth's sampler to first record your voice, make selections and loops, then play with it using the keyboard. For live performances, please check the questions section. 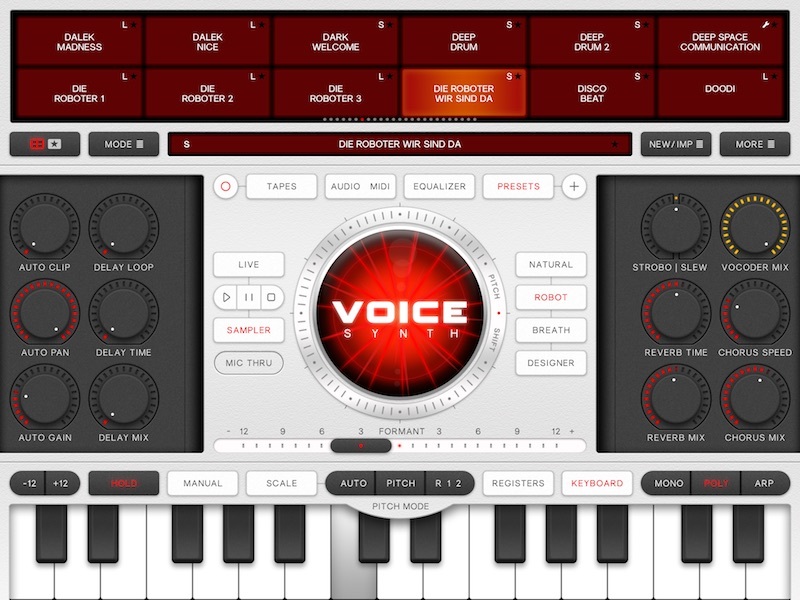 Voice Synth has a main menu in the center part of the screen, and a selectable panel at top and one at the bottom. The Mac, iPad, iPhone and iPod Touch interfaces are the same, except Mac and iPad provide a few effects (delay, chorus, reverb etc) as main controls while iPhone and iPod Touch provide these as a top panel. For details, select the manual sections for the main menu and panels. The central red information display shows all kinds of information at appropriate times. When it turns grey, there is an issue that prevents Voice Synth from proper functioning, such as no access to the microphone. Then, please check the questions section in this manual. On macOS, additionally the physical keyboard can be used to control Voice Synth. In Voice Synth, rotary dials respond to circular swiping/dragging (iOS/macOS) at the edge, as if the dials are physical. If you move your finger/pointer far off the dial, a circular motion will let the dial rotate slower, increasing your precision. The dials also respond to straight linear swiping/dragging. It does not matter if you move up, down, left, right or diagonally. Just let the dial know which direction you want it to rotate, by swiping/dragging along a path that is aimed off-center, preferably aiming alongside the dial. Then the dial will move as you want it to! Voice Synth supports Audio Units V3, enabling you to use Voice Synth as instrument and/or effect on a track in your favorite DAW, such as Apple's Garageband, Logic Pro X, etc. On iOS, the majority of 3rd party DAWs support Audio Units V3. On macOS, Audio Units exist in two versions V2 and V3. Some 3rd party DAWs still only support the older Audio Units V2. Verify that your favorite macOS DAW supports V3, otherwise contact its developer. See more on Audio Units in the question section. • Reselecting designer toggles designer test mode, in which your voice input is ignored so you can design before use. Test mode is fun to play with by itself. • Key hold, keeps the last pressed keys down until new ones are pressed. If keyhold is off, you hear nothing when you do not press any keys, no matter how hard you sing! • Monophonic (mono) mode, only one key can be down at any moment. A single human's voice can only produce one pitch at a time, mono mode ensures that Voice Synth does the same. • Polyphonic (poly) mode, any number of keys can be pressed. Use to create choirs and harmonies. • Arpeggiator (arp) mode, any number of keys can be pressed and will be played in succession. Selects also the arpeggiator top panel. Although a number of effects reside on the main menu on iPad, they are in a top panel (fx) on iPhone/iPod Touch and are therefore detailed in the effects panel section. The manual panel offers access to this manual and basic features such as rating Voice Synth. If you choose to give your opinion in the App Store, we appreciate it very much! The effects panel in Voice Synth includes Formant Shift, Mic Thru, Auto Clip, Auto Pan, Auto Gain, Delay, Reverb, Chorus, Vocoder Mix and Strobo/Slew. The following effects reside elsewhere: vocoder selection, pitch and musical scale shift (main menu) and equalizer (equalizer panel)..
Formant Shift adapts your voice spectrum by ±1 octave. For voices, it sounds like changing your headsize from child to normal to giant. For sounds that lost their voice character, it sounds like a filter ranging from bass to treble. Mic Thru is used to feed your unprocessed voice thru. It may be usefull during performances when you temporally want to speak with normal voice. It is also fun to alternate Mic Thru on and off to hear the exact effect that Voice Synth creates. Provides an adjustable distortion effect. Great for evil voices and heavy metal guitar sounds. Provides an adjustable effect to automatically position lower-frequency sounds in the left of the stereo sound field, and higher-frequency sounds on the right. The stereo panning is adaptive to how you play and sing. Voice Synth processes not only its own sounds like a conventional synthesizer, but also your voice which is an external source. It may just occur that the output volume is fine at one moment, but suddenly soft when you speak soft or have the mic further from your mouth. With Auto Gain, you can adjust the volume range that Voice Synth will adapt to automatically. Use with care, as high auto gain may also cause noise to be amplified when you deliberately speak soft. Delay is a well-known effect to add echos, with three controls. Delay Mix adjusts the volume/strength of the delay. Delay Loop adjusts how the volume of subsequent echos diminishes over time, with zero loop you hear just one echo, with e.g. 10% loop the echos diminish over time, with 100% loop the echos never diminish (a true audio looper). Delay Time ranges from 0-2 seconds, with times around 0.3 sec sounding like echos, around 1 sec like audio looping, and below 0.1 sec will add a metal character to the sound. The Delay Time can be synced to other timed effects (sampler, arpeggiator and strobo). When synced, Delay Time will be automatically adapted by a few percent to align the timings to usefull ratios (1:1, 3:2, etc), providing interesting rhythms. Reverb is a well-known effect to add reverberation, providing the impression of a room in which sound reverberates. Mostly, reverb is essential to give sounds a natural and comfortable impression. Reverb has two controls. Reverb Mix adjusts the volume/strength of the reverb, Reverb Time adjusts the time of the reverb between 0-4 seconds, relating to the small/big room sizes. Chorus is a well-known effect to add the impression of multiple people singing the same together at the same time. Chorus has two controls. Chorus Speed regulates the speed with which the multiple people sing slightly out of pace. Chorus Mix adjusts the volume/depth of the chorus. In earlier Voice Synth versions, a separate control for Chorus Depth was available which is currently integrated in Chorus Mix. This allows you to partially mix the vocoded sounds with your original voice. Use to e.g. mix in beat-boxing to get your drum effects audible, or to add a 2nd voice via a vocoder while using your original voice as 1st voice. Your original voice will still pass through the standard effects like auto-pan/clip/gain, delay, chorus and reverb, but not through the selected vocoder, pitch/scale shift, equalizer, formant shift, strobo/slew, keyboard, registers and arpeggiator. Slew, or vocoder slew rate, is a vocoder-specific effect to provide extra endurance to sounds that already stopped. In combination with other effects, it produces sounds of plucked strings, wind, thunder, and storms. Strobo, or stroboscopic vocoder gating, gives your voice a stroboscopic effect, with a strobotime adjustable from 0-1 second. The Strobo time can be synced to other timed effects (sampler, arpeggiator and delay). When synced, Strobo time will be automatically adapted by a few percent to align the timings to usefull ratios (1:1, 3:2, etc), providing interesting rhythms. The keyboard is the synth part of Voice Synth. It adjusts the pitch of your voice and creates harmonies when multiple keys are pressed. 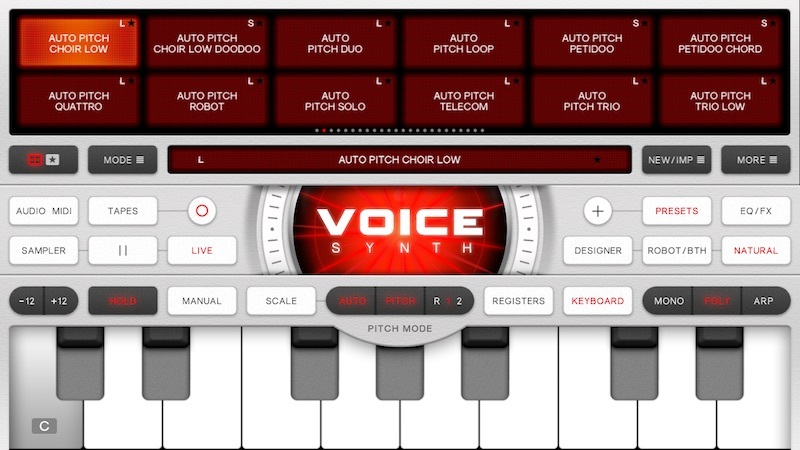 Besides the keyboard, there are three other factors influencing pitch: pitch shift and your voice according to the pitch mode (main menu), and the registers on their panel. If all of these other factors are absent (pitch mode off, zero pitch shift, registers are reset), the central C on the keyboard (in the center on iPad, the left-most key on iPhone), is the C of approx. 130.8 Hz, matching the C closest in frequency to a natural voice. The keyboard, your voice, the registers, and pitch shift, are all effectively "added" to produce the final pitch, relative to C (130.8 Hz). The registers co-operate with the keyboard, any stroke on either of them triggers all the strokes on the other, in any combination. With this, you can build-up chords in the register panel, which can be played with one keystroke on the regular keyboard. The musical scale panel allows you to include particular notes and exclude others. The excluded notes will disappear from both the keyboard and the register panel. When musical scale or AutoPitch is on, the central key on the keyboard will act as and be labeled with the current tonic, which may no longer be "C". When used as Audio Unit, Voice Synth may not have access to the physical keyboard. The register panel has 49 on/off toggle keys, ranging from -2 to +2 octaves, to add or dress up each keystroke on the regular keyboard. When the registers are reset (orange button), only the middle (M) register is on. Effectively, the registers are then "inactive". When the low register (L, on octave lower) is also on, to every keystroke on the regular keyboard an extra keystroke will be generated one octave lower. Etcetera for all registers. With this, you can build-up chords in the register panel, which can be played with one keystroke on the regular keyboard. The musical scale panel allows you to include particular notes and exclude others. The excluded notes will disappear from both the keyboard and the register panel. On the scale panel you can adjust musical scale by selecting and deselecting indivual notes (C, C#, D, ... A#, B), or select one of the 6 presets (major, minor, harmonic minor, pentatonic, diminished, augmented). You can also progress the tonic harmonically (±1) or according to the circle of 5ths (±7). The latter can also be done with the scale shift ring on the main menu. The equalizer is a 24-band equalizer with VU meters and sliders. The sliders adjust frequency bands relative to another by ±12 dB. The sliders are freely adjustable manually (drag vertically or swipe horizontally), and via ten presets (loudness, telecom, high-pass etc). The arpeggiator allows you to automatically play all active registers and keys pressed on the keyboard in a progressive pattern over time. The pattern can be adjusted to upwards, downwards, first up then down, or first down then up. The so-called "gate" can be adjusted from 1 to 100%, meaning notes will be activated only a percentage of the time during the progression. The whole progression can be repeated over 2, 3 or 4 octaves (or not repeated, that is 1 octave). The speed can be adjust from very slow (1/8 Hz, or 7.5 BPM) to very fast (20 Hz, or 1200 BMP). The plus and min buttons at the slider ends can be used to finetune BPM (±1). The arpeggiator speed can be synced to other timed effects (sampler, delay and strobo), by tapping the sync icon in the ARP display, or in the ARP button on the main menu. When synced, arpeggiator speed will be automatically adapted by a few percent to align the timings to usefull ratios (1:1, 3:2, etc), providing interesting rhythms. The arpeggiator can be triggered, or restarted, in different ways: Never (it runs freely), at the first keystroke while subsequent additional keystrokes are ignored, at every keystroke, or by the sampler when it starts playing. In the latter case, if the sample is looping, the arpeggiator's progression can be microsynced to the closest current note at every sampler looparound. Instead of playing all registers and keys one by one, the keys can be grouped into a chord to be played at once, while the registers are played progressively. Or vice versa, or both. Designer is the special voice mode that allows you to fully design a waveform, visually and by listening to it before being mixed into your voice (Test Mode, activated by retapping the Designer button on the Main Menu). Designer includes four highly customizable oscillators, sine, triangle/sawtooth, square and noise, and a mixer that allows for additive, maximum and multiplicative mixing plus combinations. Includes volume and base frequency (1x up to 5x), harmonics strength, and clipping to top or bottom (try it out). Includes volume and base frequency (1x up to 5x), skew to adjust falling sawtooth, triangle or rising sawtooth, and clipping to top or bottom. Includes volume and base frequency (1x up to 5x), width or dutycycle, and smoothness or filter. Includes volume and type (white or voiced), filter (low or high pass), and clipping to top or bottom (can be used to generate hail/speckle noise). Includes a slider to adjust the amount of additive, maximum and multiplicative mixing. When multiplicative mixing is active, the phase can be adjusted (X-Phase). If X-Sync is off, the phase is free running creating all sorts of low and bell-like frequencies. If X-Sync is on, the phase is synced but can still be offset with the X-Phase slider. Sounds incomprehensible? Just try it out! The sampler allows you to record or import your clean, unprocessed voice or audio (REC/IMP button), rename, delete and duplicate samples (MORE button) and play samples using the keyboard while adjusting effect settings. The sampler panel has two views, the library and the editor. In the library, you can list all samples, or only your favorites (toggle via button with grid and star icon). You can select a sample, and mark or unmark them as favorite (toggle the black/white stars on samples). You can adjust whether samples are played automatically when selected (toggle via the button with rectangle and small play icon). In the editor, you can see the selected sample, make a selection (white flags), zoom in/out to selection or full sample (button with loupe icon), enable hold or loop points (top-left button) and position them (red flags), set where to start playing (next button to choose the white start flag or the red loop start flag), set when to trigger play (next button, any keyboard stroke, the first in a range of strokes, the first but only when not already playing, or not by keys but only by the main menu play button), set how to keep looping (next button, until last key up or permanent), and set when to stop playing (next button, at sample end or at last key up). Further, you can adjust sample play speed, from -800% to 0% to +800%. The sampler cannot be time synced itself, it is the timing source for optionally syncing the arpeggiator, delay and strobo effect times. A preset contains all Voice Synth effect settings, possibly together with a sample. Presets can be saved from the (+) button on the Main Menu. The presets panel shows the library of all presets, or your favorites (toggle via button with grid and star icon). In the library, you can select presets which become active immediately, mark/unmark them as favorite (toggle the black/white stars on presets), delete, duplicate, rename and export them, or revert changes (MORE button). You can also start anew with zero effects, randomize all effects, import presets from the pasteboard or from file, or browse/reinstall presets via our website from within Voice Synth (New/Imp button). After selecting a preset in the library, this preset will be "active", and show up bright red. Once you change any effect (that may happen very fast), the preset is considered "changed" to a new preset that has not yet been saved. The long name bar below the library will light up bright red. Presets can also be imported when received e.g. through mail, by tapping and holding the preset and select "Copy To" or "Open In" and choosing Voice Synth. If you get only the option to "Copy" (e.g. in Messages), choose "Copy", goto Voice Synth and import the preset via NEW/IMP and choose iOS pasteboard. Presets normally include all effect settings, in particular whether they use live or sampler mode. This is indicated in the library (L and S). Designer Test presets are indicated by a tool icon. With the Mode button, you can change which settings are used or not when saving/loading/exporting/importing presets. This feature is intended for advanced users, and may be present only partially in Voice Synth Modular depending on purchased modules. The tape panel shows the recordings made with the record button (+) on the main menu. You can select tapes, play/pause and stop and drag the time slider. With the MORE button, you can delete and rename tapes. You can export/share/save tapes in uncompressed wav or aac-encoded formats at several bitrates, to email, facebook, messages, AirDrop, Files etc (the various options may require compatible hardware and/or proper accounts setup). The Audio Midi panel is for advanced users. It shows which audio device is currently active, the device input and output gain trimming, the noise gate, midi device and channel, background audio, engine reset, and intro-sound. The audio input icon shows which audio source is currently used as input, e.g. the built-in mic, an external mic, a connected audio device, or an audio unit icon if Voice Synth is hosted by a DAW as effect. Tap the icon to select a different audio input among possible other available options. On macOS, audio input can be chosen independently from the output. On iOS, audio input and output are sometimes paired. Also on iOS, the input selector offers additional options to choose type and/or mode of your bluetooth devices. The input gain trim slider is located below the audio input. It adjusts input gain from -20 to +20 dB. The audio output icon shows which audio destination is currently used as output, e.g. the built-in speaker, headphones, a connected audio device, or an audio unit icon if Voice Synth is hosted by a DAW. Tap the icon to select a different audio output among possible other available options. On macOS, audio output can be chosen independently from the input. On iOS, audio input and output are sometimes paired. The output gain trim slider is located below the audio output. It adjusts output volume from -20 to +20 dB. This is separate from the normal +/- audio volume controls on your device. The noise gate is used to suppress input noise from mics, while letting your voice pass through. It has three components. First, the manual noise gate shows the input VU level with a slider. If the input level passes beyond the slider's right side, the noise gate opens. If the input level drops beyond the slider's left side, the noise gate closes. Adjust such that the environment's noise does not open the noise gate, but your voice does. Secondly, you can turn on "Auto" which will set the slider automatically based on the average incoming noise and voice. Check whether auto or manual works best in your case. Finally, the third noise gate component is a separate adaptive noise reduction. It is fully automatic and frequency-adaptive. It may supress high frequency noise while letting through a low frequency voice. It has no settings apart from on/off (bypass). It is naturally on, select bypass for high-quality low-noise mics, and also if you prefer some noise over the slight effect the adaptive noise reduction has on audio input. Reset all components of Voice Synth's engine and clears all midi keys currently down. Use e.g. to clear midi keys that got stuck down, or silence delay/reverb audio tails prior to starting a tape recording. On iOS, enables Voice Synth's engine to continue in the background after leaving the app, allowing you to operate other apps on your device, or turn of your screen to save battery. On macOS, this feature is always enabled. Enable or disable the sounds and animations when Voice Synth is launched. Disable e.g. for live performances to prevent audio clutter. Select none, one or all of the available midi sources to drive Voice Synth's keyboard and effects. You can select hardware controllers connected to your device, midi outputs from other apps, or Voice Synth's midi input, to which you can connect within other apps. When Voice Synth is hosted as audio unit by a DAW as midi-controllable instrument or effect, the host will always be selected as additional midi source, and the audio unit icon will appear next to the selected midi source. Select one or all of the 16 midi channels. The button is responsive to presses on the left and right side, to change channel up or down. See Midi Messages and Control Codes in the Questions section. Voice Synth is very well suited for live voice performances, e.g. musicians on stage or using a robot costume with voice processing. For this, one must consider how to connect microphones, speakers, audio interfaces, and in general, the amount of audio latency, and the prevention of input noise and/or loud audio feedback. Your Apple device can be connected to mics/speakers/mixers via the analog jack connector, digitally via the lightning port (iOS), via USB (macOS) and wirelessly e.g. via Bluetooth. The analog connector is a 4-pin mini-jack plug with a stereo output signal, and a mono input for the mic with a very tiny bit of power as required by most headsets. Connecting this jack plug to separate mics/speakers or inputs/outputs of a mixer requires a splitter cable or analog interface. Splitter cables are available in a wide variety, but we do not recommend them as in our experience they provide very varying results. Dedicated analog interfaces are also available (e.g. iRig PRE). We recommend the use of digital audio interfaces. On the Mac, connect them via USB or firewire etc. On iOS, they connect via the lightning port. Interfaces are available that connect directly to the lightning port (e.g. FocusRite iTrack Solo Lightning), and possibly offer simultaneous power charging. Alternatively, an Apple lighting-to-usb-camera-adapter enables to connect a standard usb audio interface (e.g. Behringer UFO202). Many usb audio devices work really well, provided they need little power and no special drivers. This is a cheaper option and you have a wider range of audio devices to choose from, but always check if your audio device is supported. The Apple lightning-to-usb-3 additionally offers the option to charge your device, which is strongly recommended for live performances. We do not recommend the use of wireless bluetooth speakers, unless your specific performance does not suffer from the higher audio latency, see below. Audio latency is the inevitable delay between a microphone picking up your voice, and finally a speaker producing sound based on your voice. Voice Synth is designed to keep the digital signal processing latency below 5 to 10 msec depending on your Apple device. This latency is practically inaudible, and lowering it further would be a big burden on your device's processor. A second source of latency is the route between your device and the mic/speaker. Even the device's electronics for the built-in mic and speaker (or equivalently the 4-pin headset jack input) produce a bit of latency in the order of a few msec. If you use an audio interface, e.g. via USB, that interface will come with an additional latency depending on the product. Typically, these latencies are low. Bluetooth speakers are designed for high-quality audio reproduction which technically translates into a considerable latency (0.3-1 sec). In some occassions this could be acceptible, e.g. scaring people in another room with a deep robot voice. For onstage performances, however, the bluetooth delay would make you stutter and disable you keeping in sync with the other musicians and/or a musical beat. On iOS, see also the iOS Bluetooth devices section. Dedicated anti-feedback processors may or may not help, as they are generally not designed for handling strongly processed voices such as by Voice Synth. After a reinstall of Voice Synth Modular, on the same or a new device, your earlier purchased modules are normally installed automatically. In rare cases such as a device restore, your purchases may not be directly reinstalled. Then, open the in-app store page within Voice Synth Modular and locate "Restore previous purchase". Press it and follow the instructions to restore your modules. Note that you are never charged again for purchases already made earlier, regardless whether you restore or try to re-buy a module. Do make sure that you currently use the same Apple ID as for the original purchase. Your current Apple ID is shown in device Settings, the original Apple ID used for purchase is shown in the receipts Apple sends by email shortly after purchase. If this does not help you out, contact us directly at contact@qneo.net. Is the central display grey? Then there is a true issue with audio in or out and the display will inform you about the cause. On iOS, it may be that you did not grant Voice Synth access to the mic in your device's Settings. You can always adjust your microphone permissions in the device Settings/Voice Synth/Microphone. In rare cases, there is an issue with your device's audio system such as no connection to the mic or speaker. This may be resolved by stopping other audio apps (on iOS, double-tap the home button, swipe other apps off your screen), restarting Voice Synth (on iOS, double-tap the home button, swipe Voice Synth off your screen, tap home button and launch Voice Synth), disconnecting/reconnecting audio devices and/or rebooting your device. Is the central display red? Voice Synth fully supports iOS Bluetooth audio devices. To get satisfactory results, please consider the following. Bluetooth can stream audio in two different basic modes. The high-quality mode allows for HiFi stereo audio streaming towards speakers, while not allowing for a mic signal to stream back. To ensure quality over a wireless connection, audio is typically delayed substantially, e.g. 0.3-1 second. This is irrelevant when playing pop music songs, but it may be too much delay when used with a live musical instrument/voice transformer like Voice Synth. The second Bluetooth mode allows for lower-quality mono streaming but in both directions, primarily intended for headsets. Lower quality, but less delay. When selecting the audio input route on the Audio Midi panel, Voice Synth offers to enable/disable the two Bluetooth modes individually. The low-quality mode allows for mics/headset, the high-quality mode for HiFi speakers. By default, both are enabled such that every device can connect. To complicate matters, many HiFi speakers nowadays incorporate a small microphone, and support both high-quality stereo and low-quality mic/headset formats. If both modes are enabled, and a device supports both, iOS gives precedence to the low-quality headset mode. If you change the mode options, sometimes a device requires an off/on cycle to have iOS reconnect with it using the selected mode. Further, iOS sometimes couples input and output audio routes in ways not documented. All together, experiment with your devices, and Voice Synth Bluetooth settings. In the other app, follow the methods for that particular app to copy audio onto the pasteboard. Then goto Voice Synth, select the sampler panel, press the REC/IMP button and select "import from pasteboard". Note that Apple's Garageband only supports audio copy/paste among tracks within Garageband. The "copy" action does not leave audio on the pasteboard to "paste" within other apps such as Voice Synth. Note also that Apple's' Messages audio files (those recorded within the app with the mic icon) are in a format inaccessible to Voice Synth. In the other app, select an audio file and share it via "Copy To Voice Synth" option. In some other apps, you may only get the option to "Copy", which means copying to the iOS pasteboard. Voice Synth responds to the normal key up/down and pitch bend/modulate midi messages, as well as dedicated preset/sample selection messages and control code messages. Numbers are shown in hexadecimal and (decimal), statuses are shown for midi channel 1 (zero low nibble). Voice Synth supports Audio Units V3 (AUv3), enabling you to use Voice Synth as instrument and/or effect on a track in your favorite Digital Audio Workstation (DAW), such as Apple's Garageband, Logic Pro X, etc. On iOS, the majority of 3rd party DAWs support Audio Units V3. On macOS, Audio Units exist in two versions, V2 and V3. Some 3rd party DAWs still only support the older Audio Units V2. Verify that your favorite macOS DAW supports V3 audio units, otherwise contact its developer. Next comes info about audio unit types, a comparison with IAA on iOS as supported by older Voice Synth versions, and example usage of different audio unit types in iOS Garageband, macOS Garageband and macOS Logic Pro X, and finally some in-depth details about Audio Units on macOS. In earlier versions of Voice Synth on iOS, a pre and post effect could be inserted within Voice Synth via IAA. Currently you can still insert them similarly, but now within the DAW as Audio Units, in effect slots before and after the Voice Synth effect Audio Unit. That way, you can control Voice Synth as well as pre/post effect all from one place, the DAW. 4) tap +, select audio unit extension, Voice Synth. 7) Then tap record on the transport controls. That's it. The track will contain your unprocessed voice, and Voice Synth will apply its effect live during record as well as play. Create a new track with an audio unit as source. Select Voice Synth. The type of Audio Unit automatically will be instrument . This simple step may superficially resemble how IAA was used before the update to record your voice with applied effects. But is is very different. Voice Synth will not be used as effect, but as audio source, in sampler mode allowing you to play with the keyboard, without live voice input. 1) Create a new (or first) "Audio" track, to record from mic or line input. That's it. The track will contain your unprocessed voice, and Voice Synth will apply its effect live during record as well as play. Note that macOS Garageband currently does not support midi input to effect Audio Units. 3) Open the "Plug-ins" list. Typically there is a first, single item followed by an empty list of "Audio FX"
4) Click on the first single item, at the arrows that become visible when hovering over the item. Select "AU Instruments/Qneo/Voice Synth" to add Voice Synth. That's it. The track will contain your midi notes that Voice Synth will play via its sampler. 3) Click on the instrument (typically E-piano), at the arrows that become visible when hovering over the item. Select "AU Instruments/Qneo/Voice Synth" to add Voice Synth. On macOS, Audio Units V3 can be used in two modes. This can be adjusted via Logic Pro X's Plug-In Manager. With "AU3" mode enabled, audio unit usage is more secure but requires a lot of CPU, which can lead to hickups and system overloads. Currenly, macOS defaults to "AU3" mode turned off which leads to better performance. Note that on iOS, audio units are always used in the full AU3 mode, with good performance.